Turning big data into tangible business value can be difficult even for highly skilled data scientists. Many data scientists and analysts do not have a deep understanding of Hadoop, so they struggle with solving their analytics problems in a distributed environment. Distributed algorithms are not always easy and intuitive, and there are many different approaches. Zoltan Prekopcsak outlines the best practices that make life easier, simplify the process, and implement results faster, helping you organize approaches and select the right approach for the task. Zoltan Prekopcsak is the vice president of big data at RapidMiner, the leader in modern analytics. He has experience in data-driven projects in various industries, including telecommunications, financial services, ecommerce, neuroscience, and many more. 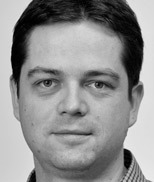 Previously, Zoltan was cofounder and CEO of Radoop before its acquisition by RapidMiner; a data scientist at Secret Sauce Partners, Inc., where he created a patented technology for predicting customer behavior; and a lecturer at Budapest University of Technology and Economics, his alma mater, with a focus on big data and predictive analytics. Zoltan has dozens of publications and is a regular speaker at international conferences.